Editor’s Note: As one of Sir Winston’s great-grandchildren, Jack Churchill has a certain home-court advantage when it comes to learning about the Prime Minister who saved Britain and democracy in World War II. Even so, it’s sometimes from books that he learns about the leader dubbed The Happy Warrior in the famous Eagle comic series of 1950s Britain. Jack has parlayed this knowledge into an online emporium of all things Churchill, winstonchurchillshop.com, which he and his business partner, Toby Sutton, run. We asked Jack to weigh in on the Levenger Press reprise of The Happy Warrior from a twenty-something perspective. 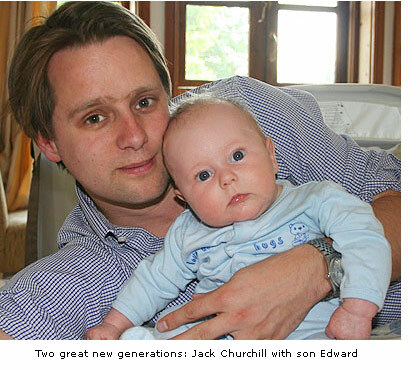 He brought an even younger observer to the August 2008 interview: Edward, the six-month-old son of Jack and Lottie. Levenger Press: “The Happy Warrior” appeared in Britain’s Eagle comic strip in the 1950s, long before you were born. Did you know about it before now? Jack Churchill: Absolutely. I remember reading a version of it when I was a child. I was probably around the same age as those children who read the original in the 1950s. I remember thinking that it was not the usual heavy book with tiny black print that you find so often on Churchill. LP: What do you recall about your first encounter with it? JC: How refreshing and easily readable it was. The bright colours and striking drawings immediately impressed. It stood out over other books I was reading at the time because the story was exciting and yet it wasn’t fiction. Of course, there was perhaps a slight bias, since the story was about my great-grandfather! LP: Were you a fan of comics? JC: From the age of about 8 I really got into them. My mother allowed me to have a weekly subscription. I chose a comic called “The Dandy,” which apparently is the world’s longest-running comic. LP: What would you say is the innate appeal of comics, or graphic novels? JC: It’s an exciting, accessible and affordable way for young people to get into reading - older people, too! I love the whole idea. LP: Given the popularity of today’s graphic novels, do you think “The Happy Warrior” could garner a whole new following? JC: I really hope so. Certainly “The Happy Warrior” is history, but hopefully reading about the adventures that Winston Churchill got up to in his 90 years will inspire others to experience their own exciting stories and write about them. LP: Is “The Happy Warrior” on your planned reading list for Edward? JC: It will certainly be one of the books that will be on Edward’s bedroom shelf. I feel sure it will give him a good introduction to the adventures of his great-great-grandfather. For now, though, he needs to learn to walk and talk before we can get him into reading.